Jiangsu Kejia Chengrui Electric Co., Ltd., currently under the jurisdiction of Suzhou Industrial Park Kejia Automation Co., Ltd., Suzhou Suji Electric Co., Ltd. and other institutions and main bodies, is a national-level high-tech enterprise integrating R&D, manufacturing, marketing and service. Our products are widely applied in the industries of electricity, electronics, telecommunication, mining, petrochemicals, railway, highway, finance, security etc. and have a bright prospect in the areas of government, school, hospital, residential and even each family. So far, it has been successfully used in many projects, such as the underground substation for Tian’an Men Square, Guang-shen highway system, Nanjing railway system, Security Urban, West-east pipeline project and so on. 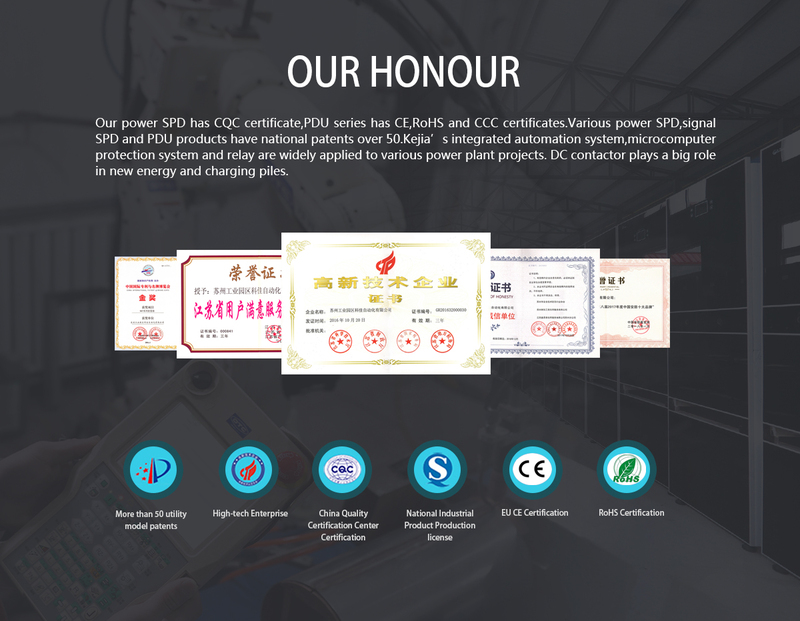 Kejia Automation Co., Ltd, a national high-and-new technology enterprise, dedicated in designing and producing Grid Automation System Equipment, PDU(Power Distribution Units) and SPD(Surge Protective Devices) with high quality and considerate service. Suzhou Industrial Park Kejia Automation Co., Ltd. (short for KEJIA Company) was established in February1998. We have specialized in the production of Surge Protective Devices, the research and development of Surge Protective technology, consulting lightning protection service, and engineering lightning protection cases for over 25 years. KEJIA Company is located in Suzhou Industrial Park and enjoys advanced manufacture techniques as well as convenient transportation access. Our company now has a top-ranking lightning protection test center, a lightning proving ground, and an intellectualized building for scientific research. In recent years, in response to market requirements, we have invested huge sums of money in Surge Protection (SPD) product development and production. Our development of SPD and production of more than 50 varieties of products, specifications and models cover the low-voltage distribution systems, telecommunications, signal networks and so on. Our products are widely used in construction, communication, monitoring, and other fields of low-voltage electrical terminal line protection. Our company has passed ISO9001:2008 and CQC certifications. KEJIA Series SPD has passed the test of national authority organization held by Beijing Lightning Prevention Device Testing Centre and Shanghai Lightning Prevention Device Testing Centre. Our company has always been supported by science and technology, forming the Quartet partners and working together to make the cause of high and low prosperity and development. We will make unremitting efforts to be bigger and stronger and create a better tomorrow! Our products always provide services with professional quality and technological innovation for you. Our company thinks that quality is the life. Several series of products have been recommended as quality improved products, and our enterprise was awarded as "Key Enterprise," "Civilized Enterprise" and other honorary titles by all levels of government departments. Please feel free to contact us for further information.